First let me start off by saying that Ireland is my favorite country that I have had the opportunity to visit. I spent a summer in Galway in 2007 and Have been back 5 times since then. To really get a feel for Ireland I recommend that you get out of the city. While Dublin is nice, it is not that much different from other big cities around the world. Most of Ireland's charm lies in the countryside. That being said, 1-2 days is enough to spend in the city before venturing out. I apologize for the lack of pictures in this post, but most of my Ireland pictures are on a hard drive which I don't have access to at this time. Because this post was via request, I wanted to get the information out now and will update the pictures as time allows. Dublin is an easily walkable city (as long as its not raining), and you can see most of the main sights in 2 days. Ha'penny bridge - picturesque pedestrian bridge crossing the Liffey. Originally people had to pay a tool of 1/2 a penny to cross. Millennium spire - Former site of a monument to Lord Nelson. Nelson's column was bombed during the struggle for independence and it is now the location of a large metallic spire. Situated across from the post office. Dublin castle - Once the site of British rule in Ireland. Now houses the Irish government. Trinity College - Oldest university in Ireland. Formally catholics were not permitted to attend. The college houses the book of kells. The old library is also worth a visit. temple bar - a section of town just to the south of the liffey. Lots of pubs. This area can become overwhelmed with tourists at times and if you are seeking an authentic Irish pub atmosphere I would recommend going elsewhere. national museum of Ireland - very much underrated museum that houses a fantastic collection of both pre-Christian and early christian gold artifacts. Admission is free so its worth stopping in even if you don't plan on staying long. Guinness Brewery - A bit out of the way. The Guinness brewery is very much geared towards tourists but there are some interesting displays. Tour concludes with a pint at the top of the brewery where you have excellent views of all of Dublin. As a side note, if you enjoy beer the Porterhouse Brewery is very much worth a visit. They are located close to the center of town and brew several good stouts as well as seasonal offerings. If time is short, i would recommend a visit here over all others. A very picturesque monastery situated in the wicklow mountains just to the south of dublin. The monastery was founded by St. Kevin in the 6th century. There are some excellent ruins including a round tower and several monastic buildings. This is an ancient burial site that is older than the pyramids. 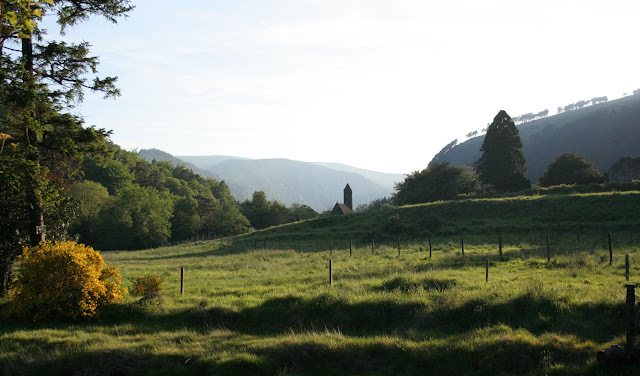 There are several tombs in the area but the highlight is the main burial mound which has several well preserved examples of ancient Celtic abstract art. A pathway leads into the center of the tomb. The mound was constructed so that on the winter solstice, the suns rays enter the burial chamber. Its really an impressive structure considering it was built about 5,200 years ago. This is a site more of historical importance than of "scenic" importance. This area was once the seat of the high Kings of ireland. All that remains now are some mounds and the Lia Fáil which translates to "stone of destiny", which is where the Kings of ireland were crowned prior to british occupation. I can't speak from experience as I have never been here. Powerscourt is a English manor house and gardens. The house its self was partially destroyed by fire but the gardens are supposedly some of the best maintained in all of ireland.